FXOptimax is a NDD-STP broker. We do not run any dealing desk. All of the trades by our clients are sent to our liquidity providers, consist of prime brokers and banks. In general, the banks and prime brokers are using 5 digits pricing, having 1 more decimal digit compared to 4 digit pricing in some of retail forex platform. In this case, we display our 4 digits pricing based on the rounding of 5-digits pricing from banks and prime brokers. For 5 digits STP accounts, we apply a simple mark up and display the price from banks and prime brokers. 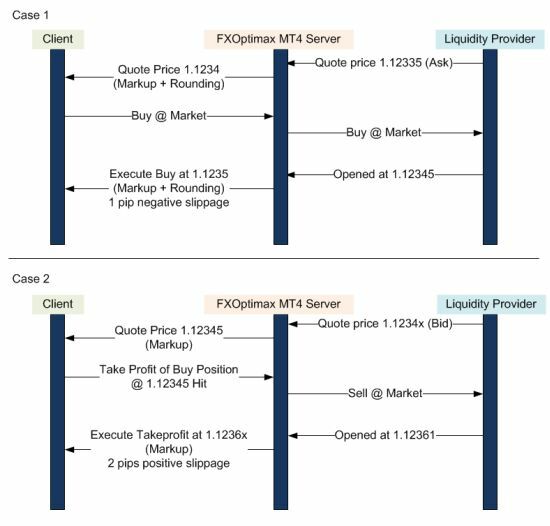 When you send an order (either market order or triggered pending order or triggered Stop Loss/Take Profit), the order will be converted to market order in our liquidity provider. The price we get from liquidity provider will be slightly marked up and rounded, then passed on to you as the execution price. Our bridge system is working exceptionally quick, just in a few miliseconds, but in some cases while the market moves extremely fast (several new price quotes in subsecond), the price that you see on your PC/mobile MT4 may already be different to the price we get from our liquidity providers. In this case, slippage may be occurred. Slippage can be both positive or negative, it solely depends to the market movement. Please see the illustration on the right side, the first case shows how you will get negative slippage, while the second case illustrates how you will get positive slippage on your order. We completely believe it is a fair and competitive trading environment and it has been our goal to create such excellent environment to maximize the profit potential you can achieve on your trade with us.